Illustrations: 55 black-and-white photos, 22 line figures, and 6 maps. The relentlessly self-promoting amateur archaeologist Heinrich Schliemann took full credit for discovering Homer's Troy over one hundred years ago, and since then generations have thrilled to the tale of his ambitions and achievements. But Schliemann gained this status as an archaeological hero partly by deliberately eclipsing the man who had launched his career. 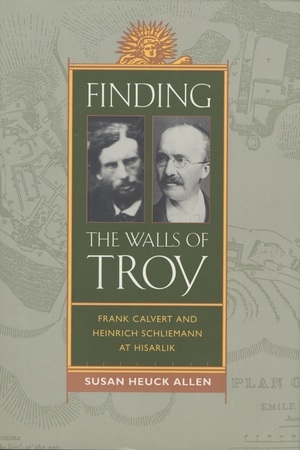 Now, at long last, Susan Heuck Allen puts the record straight in this fascinating archaeological adventure that restores the British expatriate Frank Calvert to his rightful place in the story of the identification and excavation of Hisarlík, the site now thought to be Troy as described in the Iliad. Frank Calvert had lived in the Troad—in the northwest corner of Asia Minor—excavating there for fifteen years before Schliemann arrived and learning the local topography well. He was the first archaeologist to test the hypothesis that Hisarlík was the Troy of Hector and Helen. So that he would have unrestricted access to the site, he purchased part of the mound and was the first archaeologist to conduct excavations there. Running out of funds, he later interested Schliemann in the site. The thankless Schliemann stole Calvert's ideas, exploited his knowledge and advice, and finally stole Calvert's glory, in part by slandering him and denigrating his work. Allen corrects the record and does justice to a man who was a victim of his own integrity while giving a balanced treatment of Schliemann's true accomplishments. This meticulously researched book tells the story of Frank Calvert's development as an archaeologist, his adventures and discoveries. It focuses on the twists and turns of his turbulent relationship with the perfidious Schliemann, the resulting gains for archaeology, and the successful conclusion of their common quest. Allen has brought together a wide range of relevant published material as well as unpublished sources from archives, diaries, letters, and personal interviews to tell this gripping story. Susan Heuck Allen has taught at Yale and Tufts universities and is currently Visiting Scholar in the Department of Classics at Brown University.